I have a Ford Focus Mk2 and I wanted to install the mounting points for ISOFIX car seats and I have the needed part but where can I find the installation instructions? It does sound fairly typical that these things come with no instructions. Your car manual should have information on isofix, but failing that, I found the following information on a post by Phil on www.focusowners.com - which seems like a forum you would want to look at for Ford Focus specifics. Have a read of the full post over there. Use a large flat screwdriver to unlock the hinge near the door. Lift the seat up and try to move it out of the way. Prise the rubber plugs out of the isofix mounting holes. Screw the metal bracket in with the loops facing forward. Fit the seat hinge back in place and bang down to re-engage the latch. Put the seat back to it's normal position. I wanted to fit the brackets on the smaller seat, behind the drivers side (in a UK, right hand drive car). For my late 2005 model Focus, Mark II I think, UK registration "XX54" there was nothing on the door side hinge to lever up with a screwdriver (as per many instructions out there), instead the back seats came out according to these instructions on the Focus Fanatics forum. For fitting ISOFIX (LATCH in the US) to a European Mk2 Ford Focus (2005-2010) my steps were as follows. Note that this is for a UK-registered vehicle with the single-split rear seat behind the driver. No removal of seat belts or any other bolts should be required. Disclaimer - this is my DIY attempt, I'm not a qualified mechanic so please only carry the work out if you're confident in your own abilities. Torx T50 head socket (to fit T50 bolts). Lift the lower section of the double-split rear seat cushion. Release the hinge clasp by pushing the securing metal clasp (painted white on my vehicle) with the flat head screwdriver towards the rear of the car. This should pivot open and allow the rear seat upright portion to be removed. Pull the double-split upright portion away from the (still fixed) single-split seat. Locate and remove two rubber bungs to reveal the bracket mounting points. 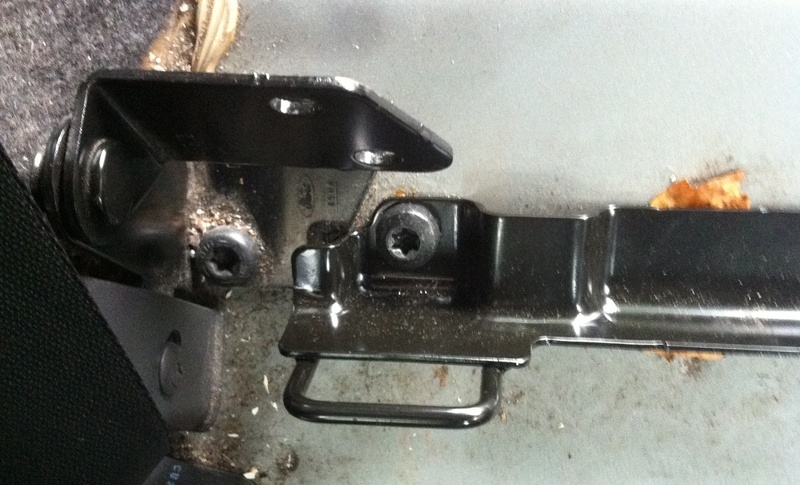 Fit ISOFIX bracket with supplied T50 bolts. You may wish to use thread-lock on the bolts. Re-fit the seat cushions, closing the hinge clasp to secure the seat upright. With the ISOFIX bracket now visible between the upper and lower seat cushions, optionally fit the two plastic guides. Further to the above steps, I created this video/slideshow to show these steps involved in fitting the Ford ISOFIX bracket. Not the answer you're looking for? Browse other questions tagged ford focus installation seat or ask your own question.